RAMALLAH (Ma’an) — Israeli forces detained more than 6,000 Palestinian children since 2015, according to the Palestine Prisoner’s Society (PPS), on Sunday.PPS said in a statement marking the Palestinian Children’s Day, that 98% of the children held had been subjected to psychological and/or physical abuse while in Israeli custody. 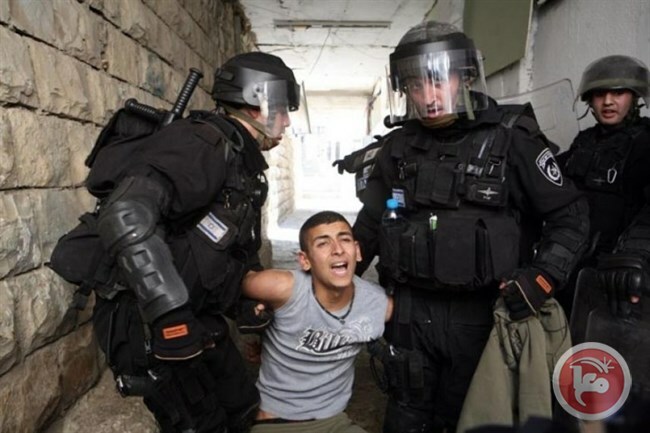 PPS said Israeli forces detained dozens of Palestinian minors after shooting and injuring them either with live ammunition or rubber-coated steel bullets.Children living in occupied East Jerusalem are the most targeted, with dozens facing arrests more than one time a month, particularly during periods of heightened tensions, such as the Bab al-Rahma (Gate of Mercy) protests in March. PPS added that minors were detained during night raids are transferred to interrogation and detention centers, where they are subjected to physical assaults, and being deprived of food and water for several hours.PPS also confirmed that the children’s right to have one parent or guardian present during their interrogation is often neglected and children are often forced to sign statements written in the Hebrew language, which they cannot read or understand. “The conditions have left released children suffering from nightmares, insomnia, decline in school achievement and reacting aggressively with their environment and society,” PPS stressed.PPS urged international human rights organizations, including UNICEF, to take “effective action against the violations committed against children who are detained by Israeli forces. ”According to prisoners rights group Addameer, there are 5,450 Palestinian prisoners being held in Israeli prisons, including 205 minors, 32 of whom under 16 years old.